Since discovering Gel-a-Peel last year, we’ve been having lots of fun with it, so when we were sent the Gel-a-Peel Sparkle Bead Station I knew it would be popular. 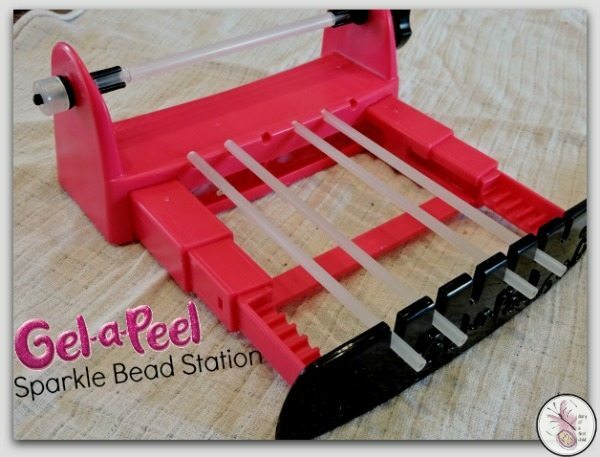 The first thing I’ll say about the Gel-a-Peel bead station is that despite the big box, it’s all quite small and compact, which is I think is great for storage and putting things away! The second thing is that like with many new tools it takes practice to get it right, or at least anywhere near what the beads on the box look like. But that’s part of the fun. In the box you’ll receive the bead station, the beading rods, the gel, string and the fittings for jewellery and three sparkle gel colour tubes – enough to make around 100 beads. Set up is very simple: my 7 year old had it set up by the time I finished reading the instructions. Simply place the beading rods into the bead station, and one at a time, use them to make your beads, then move them to the opened tray to dry. There’s one rod that’s larger than the rest – you can use this one for creating pencil grips or larger beads. The Gel-a-Peel gel is kind of like working with icing when doing a cake – it takes a little practice and the main thing is to make sure that it has plenty of other gel to attach to. Make it nice and thick and make sure it’s touching other gel on parts of the same bead so that it will stick together once dried. It’s important to leave the beads to dry long enough otherwise they just fall apart. I’d say leave them overnight. Another tip is to not put the gel too close to the edge as you need to have a bit of room to click the rods out and that can be a bit tough. Left to dry over night, the beads can be carefully loosened and then sort of ‘rolled’ off the rods and used in jewellery and other decorative occasions where you’d use beads. 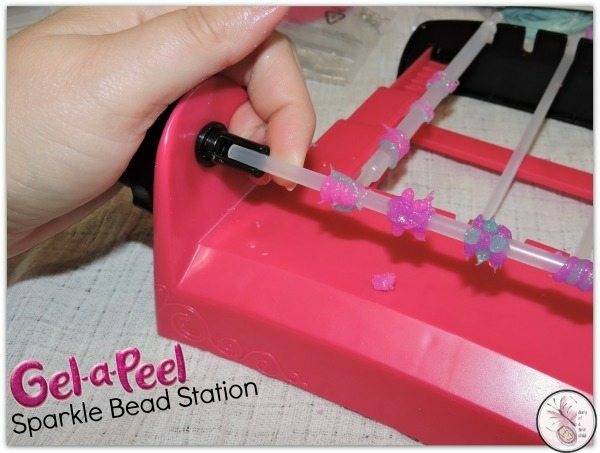 Another bonus of the Gel-a-Peel Sparkle Bead Station is that you can use other gels from other kits, as well as other accessories from other kits, so there’s lots of creative freedom. 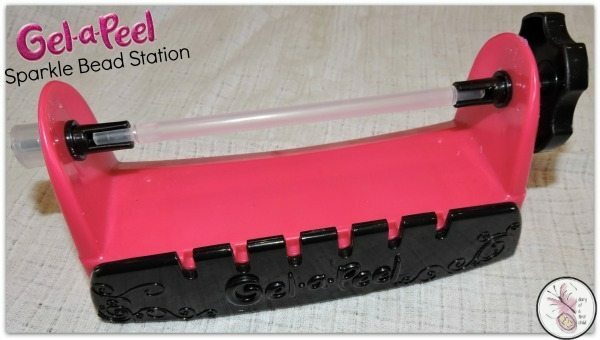 The Gel-a-Peel Sparkle Bead Station is available on Amazon and other leading toy stores.